McKee's 37 Coating Prep Auto Wash 128 oz. Home > Shop By Brand > McKee's 37 Waxes, Compounds, Coatings > McKee's 37 Coating Prep Auto Wash 128 oz. 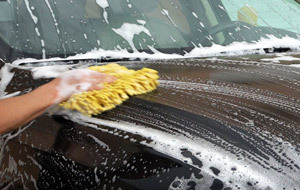 Prep your car's surface for protection with just a wash! As with most things in life, you simply cannot apply a wax, sealant, or paint coating to a surface that hasn't been properly prepped. As Alexander Graham Bell once said, “Before anything else, preparation is the key to success.” And this couldn't be truer when it comes to auto detailing! A paint coating simply won't bond to filthy paint, nor will a wax provide the best shine. Before any protection is applied, a fresh surface must be achieved – and that's where McKee's 37 Coating Prep Auto Wash comes in! McKee's 37 Coating Prep Auto Wash is a powerful detergent that removes all traces of previously applied waxes and sealants by breaking down the oils that hold it in place. The highly refined alkaline detergents found in McKee's 37 Coating Prep Auto Wash will deep clean your paint – without drying it out! Safe for use on all exterior surfaces (including delicate trim and glass! ), McKee's 37 Coating Prep Auto Wash is the first step to crystal clear paint! Regardless of when your vehicle was last washed or waxed, McKee's 37 Coating Prep Auto Wash will cut through that dirt, dust, and old wax residue and get that surface ready for detailing! Use McKee's 37 Coating Prep Auto Wash in a Foam Gun for a thick layer of suds that safely encapsulates surface contaminants for safe, swirl-free removal! For use with foam guns:Mix 2 ounces of McKee's 37 Coating Prep Auto Wash with 6-8 ounces of water and shake well. For use in buckets:Mix 2-3 ounces of McKee's 37 Coating Prep Auto Wash for every 3 gallons of water. Activate with a strong jet of water. Wash from the top down, rinsing often. For best results, dry vehicle after using a microfiber drying towel. We recommend The Guzzler Waffle Weave by Cobra for a water-spot free finish!